When Pope Urban IV renewed the call for a crusade, Gertrude became a zealous advocate of this endeavor. Together with the sisters of the monastery and many noble ladies, she collected money for the outfitting of the crusaders. When the feast of Corpus Christi was introduced to the universal Church by a Bull of Pope Urban IV in 1264, the new feast met with widespread resistance, remaining a dead letter for fifty years in many places, including Rome itself. 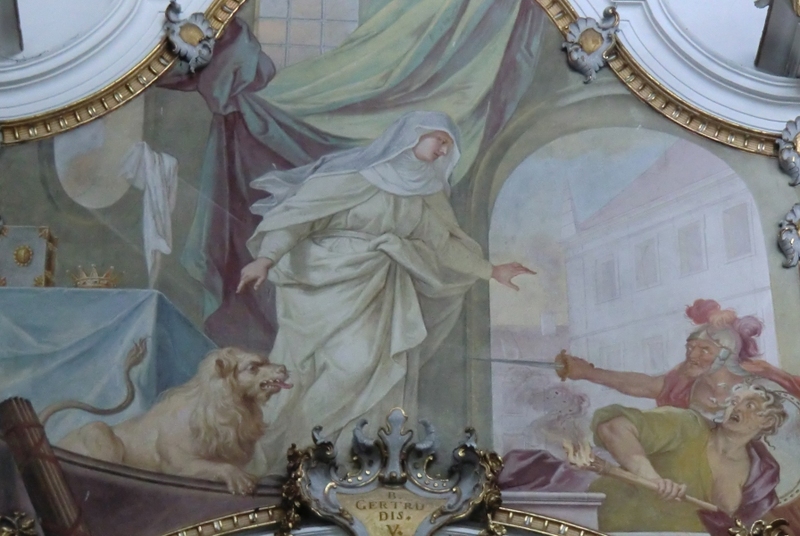 Gertrude introduced the feast at Altenberg already in 1270 where it was celebrated with the greatest solemnity, thus becoming one of the first to introduce the new Eucharistic feast. In everyday life, Gertrude took care of the needs of the poorest, both in the hospital and the monastery. She had the gift of reconciling people upon whom she implored the Divine Mercy through penance and mortification. She was 69 years old when she died after a serious illness on August 13, 1297, having led her community for fifty years. She was buried in the monastery church of Altenberg. Pope Clement V granted indulgences on her day of death and allowed her veneration in 1311 (the authenticity of this Bull has been questioned by some). Her cult as a “Blessed” was definitively confirmed by Pope Benedict XIII on January 22/March 8, 1728. The Lutheran deaconesses who now inhabit the cloister of Altenberg retain a profound veneration for Blessed Gertrude to this day. Lord, our God, whose will the holy virgin Gertrude faithfully fulfilled, grant that we, eagerly following her example, may experience You as our Father in heaven, and Your Son as our Brother accompanying us in our life. We ask this through our Lord Jesus Christ, Your Son, Who lives and reigns with You in the unity of the Holy Spirit, one God forever and ever. Amen.